Jerry Dipoto significantly improved the Mariners during the offseason, adding Jean Segura (33 SB; .368 OBP) and Jarrod Dyson (30 SB; .340 OBP), who’ll get on a base at a pretty high clip and provide speed at the top of the lineup. Dipoto added Danny Valencia as well, who has quietly put together back to back good seasons (.864 OPS in 2015; .792 OPS in 2016). Add Add three big bats in Robinson Cano (.882 OPS), Nelson Cruz (.915 OPS) and Kyle Seager (.859 OPS), and you’ve got a pretty daunting lineup. The rotation looks like it could be good, but there’s definitely some uncertainty surrounding Felix Hernandez, Hisashi Iwakuma and Drew Smyly. They’re coming off down years in which their FIP was 4.63, 4.27 and 4.49, respectively. Yovani Gallardo (5.04 FIP) and James Paxton (2.80 FIP) are the other two starters. The bullpen looks okay, with Marc Rzepczynski (3.57 FIP) and hard throwing young reliever Edwin Diaz (2.04 FIP) at the back end. Evan Scribner was nearly unhittable in a brief stint with the Mariners in 2016. The pieces are there for the Mariners to make a run. The Rangers finished 2016 on a sour note, getting eliminated from the playoffs by the Toronto Blue Jays, again. Look for ageless veteran Adrian Beltre (.879 OPS) to anchor the Rangers high powered lineup. Rougned Odor (.798 OPS) is only 23 years old coming off a 33 home run season, and Nomar Mazara was a contender for rookie of the year. Elvis Andrus (.800 OPS) and Jonathan Lucroy (.855 OPS) will provide excellent bats at the top of the lineup, too. After a strong showing in the first two rounds of the World Baseball Classic, Jurickson Profar may finally come into his own in 2017. Cole Hamels (3.98 FIP) will lead a rotation that should be pretty solid, as long as Yu Darvish (3.09 FIP) and Martin Perez (4.49 FIP) can stay healthy. The bullpen has some powerful arms, with Matt Bush (2.74 FIP) and Sam Dyson (3.62 FIP). Tony Barnette (3.38 FIP) and Alex Claudio (2.97 FIP) were solid in 2016, too. Left hander Jake Diekman will start the year on the disabled list. The Rangers have all the pieces to make another playoff run. The Mets rotation should be quite formidable in 2017, assuming everyone can stay healthy. Ace Noah Syndergaard (2.29 FIP) will lead the rotation, followed by Jacob Degrom (3.32 FIP), former ace Matt Harvey (3.47 FIP) and Steven Matz (3.39 FIP). Zack Wheeler, Robert Gsellman (2.63 FIP) and Seth Lugo (4.33 FIP) will compete for the fifth spot in the rotation. Jeurys Familia is expected to receive a 30 game suspension for domestic violence, which might affect the bullpen early in the season. Addison Reed (1.97 FIP) will fill the closer’s role in the meantime. Jerry Blevins (3.05 FIP) and Hansel Robles (3.56 FIP) will have to step up in Familia’s absence, too. The Mets lineup, which was fifth in home runs last year, is intact. Yoenis Cespedes (.884 OPS) is back on a four-year contract. Neil Walker (.823 OPS) and Asdrubal Cabrera (.810 OPS) provide a solid veteran duo up the middle. Despite not having concrete spots in the field, TJ Rivera (.821 OPS; 105 AB) and Wilmer Flores (.788 OPS) will contribute offensively as well. Lucas Duda will look to bounce back after an injury hampered 2016. Curtis Granderson (.799 OPS) has had back-to-back good years. The Mets do have some significant question marks. For one, will David Wright be on the field consistently, and if he isn’t, will Jose Reyes be able to replace him? Is the Mets 2016 home run rate sustainable? Can Michael Conforto play like he did in 2015? The Mets may challenge the Nationals for the top spot in the NL East, but will likely compete for a wild card spot. Finishing at the bottom of the league several years in a row allowed the Astros to stockpile a ton of talent via the draft, using some prospects as trading chips and developing others. After 2015 ended in a wild-card berth and 2016 in a near miss, the Astros are ready to make a strong run in 2017. Already having one of the best offensive infields in baseball, featuring Jose Altuve (.928 OPS), Carlos Correa (.811 OPS) and Alex Bregman (.791 OPS), the Astros added veteran bats Brian McCann (.748 OPS), Carlos Beltran (.850 OPS), Josh Reddick (.781 OPS) and Nori Aoki (.738 OPS) in the offseason. Add George Springer (.815 OPS) and Evan Gattis (.826 OPS), and the Astros have created one of the best offenses in baseball. The rotation doesn’t look as promising. Dallas Keuchel will probably never match his 2015 campaign, so Lance McCullers (3.00 FIP) will have to step up and become the Astros go to guy. Collin McHugh has underperformed his FIP the last two seasons, so a big season may be in store for him. Mike Fiers and Charlie Morton will slot in at four and five. The bullpen, which features Luke Gregerson (2.99 FIP), Chris Devenski (2.34 FIP), Will Harris (2.35 FIP), Pat Neshek (3.68 FIP) and Ken Giles (2.86 FIP), looks great; they only lack a good left handed reliever. Tony Sipp’s FIP jumped from 2.93 in 2015 to 6.19 in 2016. 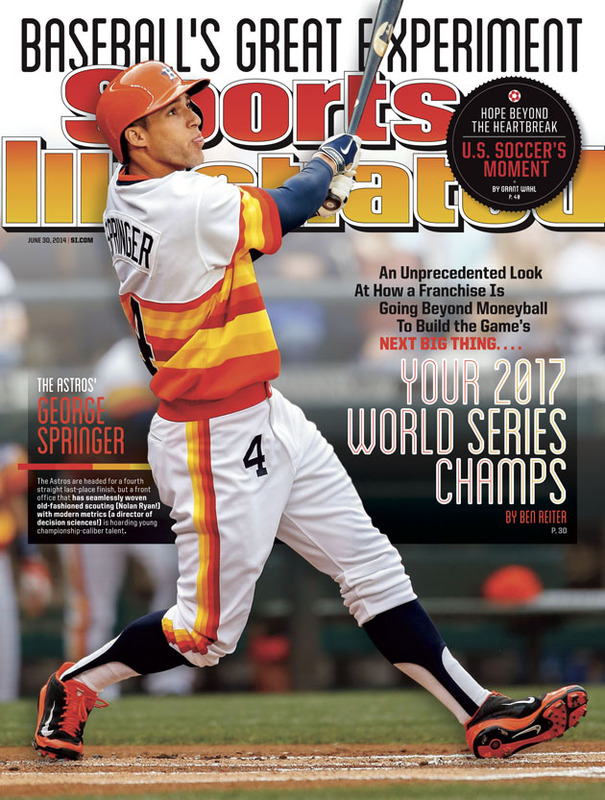 If the current rotation can sustain the Astros, they’ve got a good chance to go all the way in 2017, just like Sports Illustrated predicted. After blowing 30 saves as a team last year (Yes, 30), the Giants addressed the issue by signing free agent closer Mark Melancon. Derek Law is also an intriguing arm coming out of the bullpen. Leading the rotation is Madison Bumgarner, who believe it or not, is only 27. He’ll be supported by Johnny Cueto (2.95 FIP), Jeff Samardzija (3.85 FIP), Matt Moore and Matt Cain. The lineup looks solid as always, with former MVP Buster Posey, defensive wizard Brandon Crawford (.772 OPS), underrated first baseman Brandon Belt (.868 OPS) and Hunter Pence (.808 OPS). The Giants are a pillar of consistency in the National League. Look for them to make a run. The Nationals obvious strength in 2017 will be their rotation. Led by ace Max Scherzer (3.24 FIP), the four other starters are Stephen Strasburg (2.92 FIP), Tanner Roark (3.79 FIP), Gio Gonzalez (3.76 FIP) and Joe Ross (3.49). The bullpen looks decent, with Blake Treinen (3.62 FIP), Sammy Solis (2.78 FIP) and Shawn Kelley (2.97 FIP), but does have an obvious weakness: the closer. The Nationals passed on Kenley Jansen and Aroldis Chapman, saving $80 million, but that could come back to bite them. They need a good closer to shut the door at the end of games. Despite losing Wilson Ramos, the Nationals lineup is dangerous. Bryce Harper will look to bounce back from a “down year” in which his OPS was .814. Daniel Murphy (.985 OPS) is coming off a career year; he was a legitimate MVP candidate. Anthony Rendon (.797 OPS) and Jayson Werth (.752 OPS) are solid, and rookie sensation Trea Turner (.937 OPS) accumulated a 3.7 WAR in less than half a season. The Nationals are vying for the top spot in the NL East, again. The team that came oh so close to winning it all in 2016 looks even better in 2017. Unfortunately, all-star Michael Brantley is still not 100% after missing most of last year, and may miss opening day. Even without him, the Indians lineup is stacked. Edwin Encarnacion (.886 OPS) will provide an upgrade at 1B/DH, and Yan Gomes will add some pop to the lineup after playing only 74 games in 2016. Double play duo Francisco Lindor (.794 OPS) and Jason Kipnis (.811 OPS) are mainstays in the lineup, as is 1B/DH Carlos Santana (.865 OPS). Utility man Jose Ramirez impressed with his .825 OPS in 2016. Andrew Miller (1.68 FIP), the postseason juggernaut, will anchor the bullpen, along with Cody Allen, Dan Otero and Bryan Shaw. Frontline starters, Carlos Carrasco (3.72 FIP) and Danny Salazar (3.74 FIP), look to bounce back from injuries. Trevor Bauer’s coming off his best season yet (3.99 FIP). Cy Young award winner Corey Kluber will anchor the rotation, and Josh Tomlin rounds out the starting five. I almost feel bad putting the Indians at number four on this list. Cleveland’s ready to make another title run. Anchored by the best pitcher in baseball, Clayton Kershaw, and a strong supporting cast of Rich Hill, Kenta Maeda, Julio Urias and Scott Kazmir, the Dodgers rotation looks great heading into 2017. Hyun-jin Ryu, who’s been hampered by injuries for two years, has had a solid spring, which may result in a return to the rotation, too. whoSergio Romo looks to strengthen the bullpen and set the stage for Kenley Jansen, who’s returning on a five-year contract. Pedro Baez, Grant Dayton and Alex Wood are all coming off solid years out of the bullpen, too. Going into his age 23 season, Corey Seager (.877 OPS) will anchor the lineup along with veterans Justin Turner (.832 OPS) and Adrian Gonzalez (.784 OPS). After struggling in the second half in 2015, Joc Pederson (.847 OPS) bounced back last season, and catcher Yasmani Grandal (.816 OPS) had his best season yet. Logan Forsythe, who was acquired during the offseason, will give the team an upgrade at second base. If Trayce Thompson can come back healthy and build on his early 2016 success, the Dodgers may have a surprise star in the outfield. Unfortunately for the Red Sox, David Price will likely start the season on the disabled list. While his 2016 was good, Sox fans are hopeful Price can pitch more like he did in 2015. When he does return, the Sox rotation will consist of two Cy Young award winners (Price and Porcello), a guy who should probably have one (Chris Sale) and knuckleballer Steven Wright who broke out in 2016. Slot Drew Pomeranz in at number five and you’ve got one of the best rotations in baseball. The bullpen looks solid with Heath Hembree, Tyler Thornburg, Robbie Ross Jr. and Craig Kimbrel; however, they sustained some big losses this offseason, including Brad Ziegler (free agency), Koji Uehara (free agency) and Carson Smith (Tommy John surgery). A lineup laden with all-stars gives the Red Sox one of the best offenses in baseball, too. Hanley Ramirez (.866 OPS), Mookie Betts (.897 OPS), Jackie Bradley Jr. (.835 OPS), Dustin Pedroia (.376 OBP) and Xander Bogaerts (.802 OPS) give them a ton of firepower. Rookie stud Andrew Benintendi (.835 OPS), catcher Sandy Leon (.845 OPS) and super-utility man Brock Holt will contribute as well. The Red Sox are well rounded and more than ready to make another run at the playoffs in 2017. The Cubs are coming of their first championship in 108 years. A team built around a young core of players, including reigning MVP Kris Bryant, they’re sure to be good for years to come. They lost two key players this offseason, Dexter Fowler and Aroldis Chapman, to free agency. But, they’ve added an excellent bullpen arm in Wade Davis who came via a trade with Kansas City, and Kyle Schwarber is poised to put up big numbers coming off his return from injury. Add Albert Almora Jr., who only had 112 at bats in 2016, and a full season from Wilson Contreras, and you’ve got the most powerful lineup in Major League Baseball. There are so many good players to talk about on the Cubs roster, I haven’t even mentioned Ben Zobrist (.386 OBP), Javier Baez (.423 SLG), Addison Russell (21 HR, 95 RBI), Anthony Rizzo (.928 OPS) or Tommy La Stella (.357 OBP), who might be one of the most underappreciated players in baseball. With Jake Arrieta, Jon Lester, Kyle Hendricks and John Lackey, the starting rotation speaks for itself. The Cubs look to be the force of Major League Baseball once again in 2017. All data courtesy of Baseball Reference and FanGraphs.